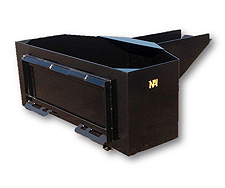 This bucket attachment is great for carrying concrete, filling grain feeders, moving gravel, dirt or other materials that need to be moved with precision pouring. This large bucket is built from A-36 steel. The bucket is 32 1/2 inches deep and 60 inches wide. It is 24 1/2 inches tall with a 30 inch spout.